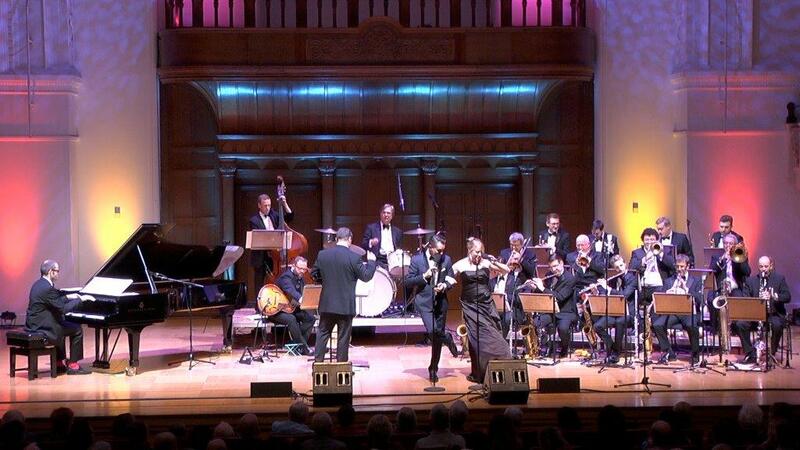 Richard Pite and the Jazz Repertory Company have made Cadogan Hall into something of a home from home. What’s more, they have attracted and kept a loyal audience, this evident yet again with a packed house for their latest LJF extravaganza. They’ve also won a regular place for their kind of serious-yet-fun re-examinations of jazz milestones within the LJF’s sometimes stern-faced annual assembly of music. Indeed, Pite was able to announce that a date had been already set for them to appear at next year’s festival. Applause all round. In coming up with a suitably enticing programme this time, Pite had looked inwards – well, to his own birthdate and deduced that 1956 was not only momentous for him but for jazz as well. In that year Count Basie released his breakthrough album April in Paris (this followed two years later by the timeless The Atomic Mr Basie), Sinatra and Riddle combined with Songs for Swinging Lovers while Ella Fitzgerald had her Cole Porter Songbook and tellingly, Duke Ellington’s At Newport recording marked a transforming resurgence in his fortunes. This gave Pite and company a template for the concert, with the very spirited Pete Long Orchestra of which drummer Pite is a part supported by vocalists Georgina Jackson covering Ella, and Iain Mackenzie channelling Sinatra each taking turns to recreate choice items from these classic recordings. As ever the proceedings were leavened by Long’s humour even as the music-making was pursued with a seriousness of purpose that any historian would applaud. Long has his own well-honed repertory company, all crack players and many quite young, who can handle the dynamic diversity required of them, seguing, say, from the ultra-slow Li’l Darlin’ to an up-tempo rouser like Shiny Stockings without turning the proverbial hair, while managing the subtleties of Miss Otis Regrets or You’re Sensational. Jackson and Mackenzie stayed close to their chosen briefs but without in any way aping their great predecessors, each authoritative and engaging in their own way, much the same applying to the band’s soloists, most notably tenorist Dean Masser and his tour-de-force on Ellington’s Diminuendo and Crescendo in Blue, as he let go a flow of ideas that may have sought to parallel that of Paul Gonsalves back in the heady days of ’56 Newport but if anything, surpassed the original. Right from the off, with altoist Simon Marsh recalling Johnny Hodges on Jeep’s Blues it was clear that Long had worked hard with his team to get the band sound right, the dynamics spot-on and tempos properly respected, this sparked by the likes of lead trumpeters George Hogg and Tommy Walsh plus lead trombonist Andy Flaxman and the marvellous rhythm team of pianist Nick Dawson, given his head on a JATP tribute in the manner of Oscar Peterson, guitarist Dave Chamberlain, bassist Joe Pettitt and Pite himself, tireless at the drums. With Long added on tenor, plus Masser and new find Joe Shenoy, there was even a gutsy tenor battle to stir the multitude, this before Jackson settled things down with more from the Cole Porter songbook. Highlights? Just hearing this fine band tear into the likes of Splanky and Whirlybird with Dawson excelling was enough to make even the most hardened Basie-ite overflow with joy. And yes, we did sing Happy Birthday for Pite, the man without whom… as Long put it, this before the evening’s final surprise, their rendition, with Chamberlain hot on electric guitar, of Bill Haley’s Rock Around The Clock, Jackson, Mackenzie and trombonist Chris Dean vocalising out front, as if to warn/remind us of the radical shift in public taste in the offing back then. Absolutely brilliant! Fantastic band, acceptable singers, wonderful music. Had three generations of my family from early 20's to pushing 90 dancing in the aisles. Glad you enjoyed the evening Julian. We've decided to do 1957 next year. It'll be Ella Fitzgerald's centenary so we'll be featuring her Duke and Irving Berlin Songbook albums alongside her two 1957 albums with Louis Armstrong as well as lots of other goodies from that year.. Hope you can make it. The date is Nov 12th 2017.